Developing a good soil for herbs is fairly simple and straightforward because herbs require very little in the way of preparation or amendments when it comes to soil. While the soil type and condition are not vital to growing herbs, some small treatments do help. One of the best steps you can take in preparing a bed for herbs is to till or turn the soil to a depth of 6 to 8 inches. This will allow the roots a better opportunity to establish themselves and help moisture reach the deepest-set tips. Average soils are adequate for growing herbs, as they can tolerate poor soil. However, organic material may be added to improve the soil’s condition and to help it retain water and nutrients to feed plant roots. Soil that will remain undisturbed during subsequent seasons is best for perennials in order to prevent their root systems from being damaged. Annuals are replaced yearly, making their placement more flexible. While fertile soils can help produce nice-looking herbs, the University of Missouri Extension warns that rich soil can cause an excess production of foliage. That foliage often possesses poor flavor, rendering the herbs showy, but unsatisfactory for the palate. Herbs generally need a pH in the range of 6.3 to 6.8, According to the Virginia Cooperative Extension. Clemson Cooperative Extension explains that pH affects the availability of nutrients to plants. Drainage issues and rainfall can influence pH levels. Water carries away vital minerals, making soil more acidic and causing plants to struggle because they lack some of the basic materials they need to build new growth or because they have too many of the wrong nutrients available. Well-drained soils are best for most herbs. Generally herbs will not perform well under wet conditions. Sage, rosemary, and thyme need slightly better drainage. Mint, parsley, chervil, and lovage are better able to adapt to higher levels of moisture. The North Carolina Cooperative Extension Service recommends the addition of a layer of mulch to keep mud from splashing onto your herbs as you work and a layer of landscape fabric to deter weeds and keep plant roots moist. This also eliminates the need to disturb the roots of perennials by pulling nearby weeds. 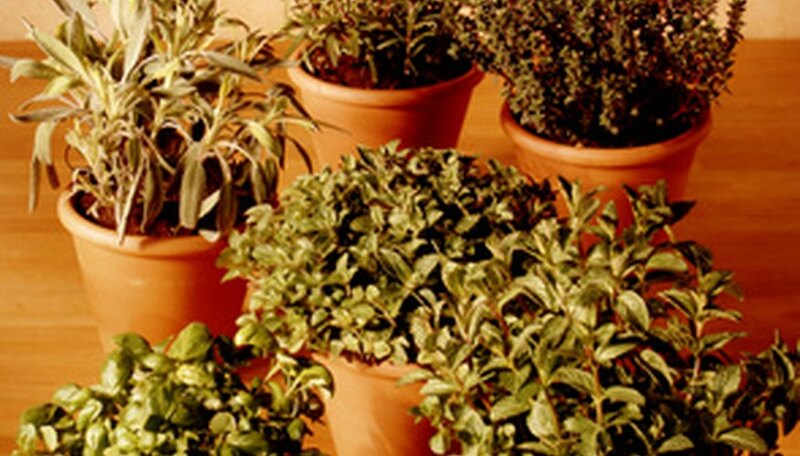 To prepare soil for herbs grown indoors, the West Virginia University Extension Service suggests home gardeners prepare a mixture of two parts sterilized potting soil and one part coarse sand or perlite as a growth medium.